I will have to write a review of my Chicago weekend later. I had THE BEST time! But I need some time to process and maybe take some pics of what I did and process some of the pics that I took. So, maybe tomorrow. In other news….. I’m waiting on a call from the nurse for Benji. He fell off of the bunkbeds yesterday and was “handling” it fine, and yesterday he was looking ok…. and now…..not so much. I just want to err on the side of caution. When the boys picked me up from the airport, I almost didn’t recognize Benji! His face looks like a hockey player’s! I really *hope* it’s not broken. We’ll have to see what the dr says…. Stay tuned. **Update** We have an appointment at 3:20 today. I’ll let you know how it goes. Oh no, Heather! 🙁 ((((((((hugs)))))))))) sweetie! OMG Heather! must have completely freaked you out!! I hope everything is okay. Keep us updated! Miss you. YIKES! Hope that everything will be okay! sooooo nice to meet you and amy is ultra jealous already. oh no… hon! What a trooper he must be. Good luck and let us know. Oh my gosh! What a lovely shiner he has. You will be so glad you got a picture of that later. My son LOVES to look at the pictures of himself when he was little and looking all tough and beat up from little boy mishaps. But for now, doggone it. 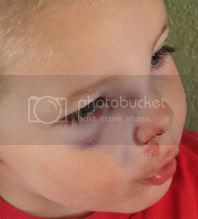 I’m sure that you about freaked out when you got off the plane and saw that cute face all bruised and battered. Hugs to you, and hugs to him. 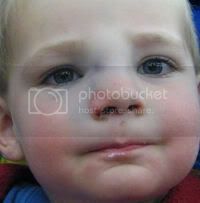 My son has broken his nose 3 times already – it’s a boy thing, ya know? That is STILL one good looking little man! It’s all part of being a little boy. You know from personal experience that they handle it a lot better than we do. Still, looking at him, my heart goes out to him and his Mommy. Give ’em all an extra hug.